To highlight the growing problem of student debt in this country, we point you toward a recent and disturbing survey by the student loan marketplace LendEDU. It found 28% of respondents said they would agree to name their firstborn daughter Sallie Mae in exchange for student loan debt forgiveness. Alarmingly, 40% of respondents said they would be willing to reduce their life expectancy by 1Y in exchange for having their student debt erased. To put things in perspective, student debt has now surpassed home equity loans/lines of credit, credit cards and automotive debt. The problem has escalated to the point where it's having a deep effect on people's financial well-being. A recent report by the American Student Assistance finds that 73% of borrowers carrying student loan debt have put off saving for retirement and 75% say the debt has affected their decision or ability to buy a house. The cost of higher education has clearly exploded. Banks can help respond to this nettlesome problem by coming up with creative ways to help customers pay down debt. Gate City Bank in Fargo, ND for instance, recently began offering a program that caught our attention. The program targets qualified individuals with student loan debt who want to finance a home purchase through the bank. 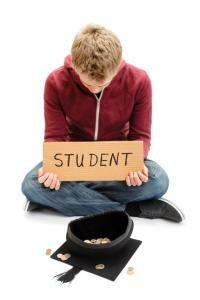 The new student loan program, announced in Nov, carries no fees and has a 1% APR. Borrowers have 10Ys to repay loans through the program. To participate, borrowers must have a 2Y or 4Y degree, have made at least 12 consecutive payments on existing student-loan debt, and they must be buying a home and financing it through the bank. There is a $50k per household limit on the student loan. Banks can help customers by letting them know they offer student loan refinancing or debt consolidation services perhaps. After all, people searching to refinance student debt don't always know where to turn and they may eventually own small businesses so getting to them early is important to building relationships. It's also important to be really clear about your refinancing standards so customers have a good sense in advance of whether or not they are likely to qualify. Banks have to be particularly careful of reputational risk in the social media-driven world we live in. All it takes is for one or two disgruntled customers to publicly vent their complaints and the good news story becomes a bad news one pretty quickly. Banks also have an opportunity to help employees who may be struggling under the weight of their student loans. Consider a new student loan assistance program being offered by Fidelity Investments to employees who have been with the company for more than 6 months. Fidelity will pay $2k a year towards their student loans, up to $10k. The benefit is not tied to retention, so employees don't owe anything if they leave the company. According to Fidelity, fewer than 3% of companies are helping their employees dragged down by student loan debt. Banks might not even realize their employees are having these issues, so it's worth investigating. It could be an opportunity to make a meaningful difference for your staff. It's truly a sad state of affairs when people feel desperate enough to forgo naming rights on their first-born or are willing to cut short their life to escape debt. Community banks may find opportunity here as you help locals dig their way out of debt. Weaker oil, the upcoming holiday weekend and limited trading pushed yields down 6bp. CNBC is reporting about 24% (4 of 17) of FOMC members have publicly expressed disagreement for holding rates steady and are pushing for increases as soon as the Apr meeting. 1) The holding company of CBI Bank & Trust ($491mm, IA) and Farmers & Mechanics Bank ($297mm, IL) will acquire Brimfield Bank ($47mm, IL) for an undisclosed sum. 2) Northwest Bank ($9.0B, PA) will acquire employee benefits and property casualty insurance firm Best Insurance Agency (PA) for an undisclosed sum. A survey by SailPoint finds 27% of US office workers say they would sell their work password to an outsider; 26% of employees said they have uploaded sensitive information to cloud apps with the specific intent to share that data outside the company; 65% use the same password among multiple applications and 33% share passwords with coworkers. Also of concern, some 42% of employees said they were able to access their company accounts and data after leaving. A survey of RSA conference attendees recently found 36% share passwords among IT staff and 55% make other users change their passwords more frequently than IT changes administrative passwords. Research by Deloitte of thousands of business and HR leaders worldwide on human capital finds 92% of companies believe redesigning the organization is very important or important (#1), as they seek to decentralize authority and move towards product and customer centric structures. Further, only 38% of companies and 24% of large companies are still structured around functional lines. Teams focused on customers are what it is all about now. Bank regulators have informed banks they must collect customer identification information on prepaid cards under the Patriot Act. Banks must ask for an ID number, customer name, birth date and address and verify the information before issuing a prepaid card.